Accidental scorpion stings are common in rural India, and the most toxic of the scorpion species found in India is the Mesobuthus tamlus (Indian red scorpion) [1-3]. Scorpion venom is a concoction of several toxins such as the hyaluronidase, serotonin, mucopolysaccharides, phospholipase, histamine, enzyme inhibitors, and several neurotoxic, cardiotoxic, and nephrotoxic polypeptides [1, 2, 4-15]. Pathophysiology of scorpion envenomation is a complex phenomenon and is mainly due to hyperstimulation of the autonomic nervous system [6, 7, 15], resulting in a wide range of clinical manifestations ranging from mild local skin reactions to severe cardiovascular, respiratory, and neurological complications [1-7, 9, 15-17]. 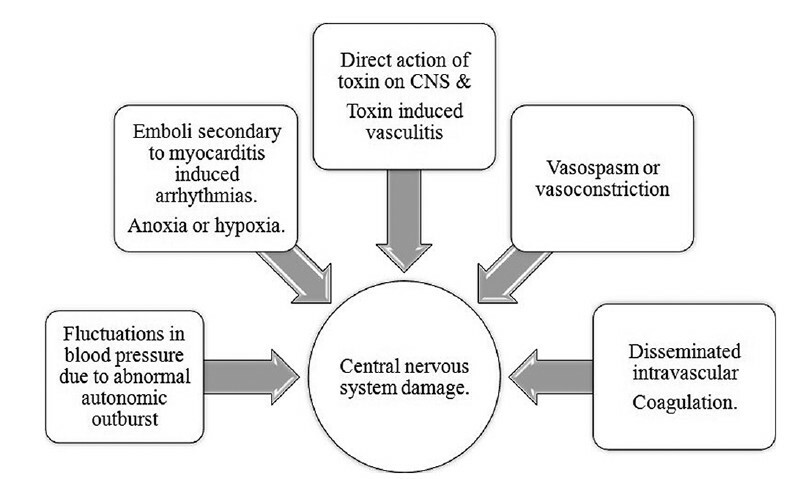 Neurologic manifestations occur as a result of blood pressure fluctuations, cardiogenic emboli, anoxia, hypoxia, disseminated intravascular coagulation (DIC), direct vasculotoxic effect of the toxin, and prolonged dehydration and vasoconstriction due to excessive catecholamine secretion. Various central nervous system (CNS) complications following scorpion sting have been described in literature, such as cerebral edema, subarachnoid hemorrhage, encephalopathy, hemorrhagic, nonhemorrhagic strokes, and cortical necrosis [2-5,8-12, 16, 18-21]; however, thalamic and cerebellar hemorrhagic manifestation has yet not been reported. We herein report a rare case of thalamic and cerebellar hemorrhages following a scorpion sting in a 25-year-old Indian male, which to the best knowledge of the authors' is the first case of its kind to document such a finding in the context of a scorpion sting. A 25-year-old male presented to our emergency room in a comatose state with Glasgow coma scale of E1V1M1, following a scorpion bite to the left hand. His vitals were unstable with a blood pressure of 90/60 mm Hg as measured over the right arm in the supine position with a heart rate of 140 beats/min. Instantaneously, ventilator support was instituted, and the patient was investigated. Complete hemogram, renal and liver function tests, serum electrolytes, coagulation profile, D-dimer were all within normal limits. Chest radiograph did not show any evidence of pulmonary edema. Electrocardiogram showed normal sinus rhythm and two-dimensional echocardiogram was normal. With no improvement in his general condition, a magnetic resonance imaging (MRI) of the brain along with an angiogram was performed following advice from neurological consult team. While MRI brain demonstrated symmetrical hyperintensities in bilateral thalami and cerebellum showing diffusion restriction and blooming on gradient echo sequences suggestive of hemorrhages [Figure 1] and [Figure 2], MR angiography was normal. A diagnosis of bilateral thalamic and cerebellar hemorrhages following scorpion envenomation was made. Patient was treated with prazosin, mannitol and other supportive measures; however, there was no clinical improvement and the patient expired. Our case demonstrates the fatal case of a scorpion envenomation resulting in cerebellar and thalamic hemorrhages in a young Indian residing in rural India. Cerebellar and thalamic hemorrhages resulting as a direct manifestation following a scorpion envenomation has not been reported in the medical literature and to the best knowledge of the authors', is the first case report documenting such clinical manifestation. Mechanism of action of toxins in scorpion venom has been implicated to the presynaptic nerve endings targeting the sodium and potassium channels [7, 22, 23]. These toxins possibly create an imbalance in sympathetic and parasympathetic systems, leading to an autonomic outburst and massive secretion of catecholamines .Clinical manifestations are a likely result of an autonomic outburst and direct actions of toxin on various systems; role of cytokines in pathophysiology of scorpion envenomation is currently debated . Clinical picture varies highly depending upon species of scorpion, dose of venom, site of injection and individuals inflammatory response to the toxins . CNS injury following scorpion sting occurs in many ways as depicted in [Figure 3]: (1) Direct action on CNS by neurotoxin results in encephalopathy [24,25]. (2) Blood pressure undulations due to counteraction of sympathetic and parasympathetic systems can result in strokes [9,25]; (3) direct damage to endothelium by toxins causes vasculitis and can lead to thrombosis of vessels and infarction [9,25]; (4) DIC may result in infarction or hemorrhagic stroke [9,25]; (5) prolonged hypoxia, anoxia, dehydration are other mechanisms by which CNS damage can occur following scorpion sting [9,25]; isolated symmetrical involvement of bilateral thalami or cerebellum is not uncommon. However, symmetrical involvement of the cerebellum and thalamus together is very rare, in our case, possibly acute rise in blood pressure and loss of cerebral autoregulation could have eventually led to these hemorrhages [21,26]. Despite adequate treatment and supportive measures, involvement of CNS in cases of scorpion envenomation carries a very bad prognosis . Early diagnosis and prompt treatment can reduce mortality and morbidity caused by neurological manifestations of scorpion sting. Hemorrhagic strokes following scorpion envenomation are infrequent with a few case reports mentioning lobar and intra-ventricular hemorrhages. As for our knowledge, this is the first case report where we encountered intracranial hemorrhages symmetrically involving the thalamus and the cerebellum following a scorpion sting. CNS involvement in these cases generally carries bad prognosis. Variable imaging appearances may mislead radiologist when blinded to the clinical scenario. Especially, this can happen frequently when patient becomes unconscious or comatose following scorpion sting and sting site is not obviously visible. Radiologists and clinicians should be aware of various neuroimaging appearances following scorpion sting to ensure correct diagnosis and prompt treatment. 1. Kumar M, Bharath R, Subrahmanyam B, Rammohan P, Agrawal A. Scorpion envenomation and its management in adults. Sahel Med J 2013;16(2):60. 2. Bawaskar HS, Bawaskar PH. Scorpion sting: update. J Assoc Physicians India 2012;60:46-55. 3. Kishore D, Misra S. Atypical systemic manifestation of scorpion envenomation. J Assoc Physicians India 2009;57:344. 4. Tiwari SK, Gupta GB, Gupta SR, Mishra SN, Pradhan PK. Fatal stroke following scorpion bite. J Assoc Physicians India 1988;36(3):225-6. 5. Fernández-Bouzas A, Morales-Reséndiz ML, Llamas-Ibarra F, Martínez-López M, Ballesteros-Maresma A. Brain infarcts due to scorpion stings in children: MRI. Neuroradiology 2000;42(2):118-20. 6. Strong PN, Clark GS, Armugam A, et. al. Tamulustoxin: a novel potassium channel blocker from the venom of the Indian red scorpion Mesobuthus tamulus. Arch Biochem Biophys 2001;385(1):138-44. 7. Gwee MC, Nirthanan S, Khoo HE, et. al. Autonomic effects of some scorpion venoms and toxins. Clin Exp Pharmacol Physiol 2002;29(9):795-801. 8. Kochar DK, Singh P, Sharma BV, et. al. Scorpion envenomation causing hemiparesis. J Assoc Physicians India 2002;50:606-7. 9. Thacker AK, Lal R, Misra M. Scorpion bite and multiple cerebral infarcts. Neurol India 2002;50(1):100-2. 10. Bonilha L, Cendes F, Ghizoni E, Vieira RJ, Li LM. Epilepsy due to a destructive brain lesion caused by a scorpion sting. Arch Neurol 2004;61(8):1294-6. 11. Bahloul M, Rekik N, Chabchoub I, et. al. Neurological complications secondary to severe scorpion envenomation. Med Sci Monit 2005;11(4):CR196-202. 12. Udayakumar N, Rajendiran C, Srinivasan AV. 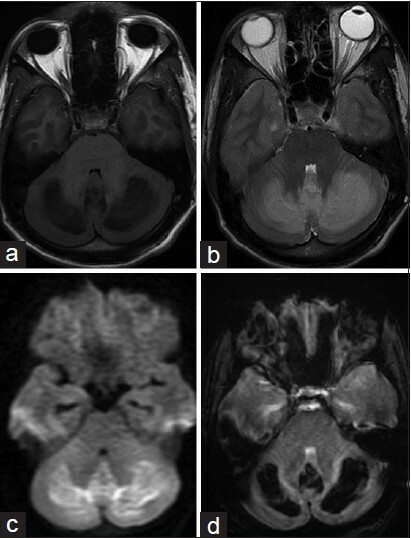 Cerebrovascular manifestations in scorpion sting: a case series. Indian J Med Sci 2006;60(6):241-4. 13. Nasr HB, Hammami TS, Sahnoun Z, et. al. Scorpion envenomation symptoms in pregnant women. J Venom Anim Toxins Incl Trop Dis 2007;13(1):94-102. 14. Sarkar S, Bhattacharya P, Paswan A. Cerebrovascular manifestations and alteration of coagulation profile in scorpion sting: a case series. Indian J Crit Care Med 2008;12(1):15-7. 15. Petricevich VL. Scorpion venom and the inflammatory response. Mediators Inflamm 2010;2010:903295. 16. Chelliah T, Rajendran M, Daniel MK, Sahayam JL. Stroke following scorpion sting. J Assoc Physicians India 1993;41(5):310. 17. Karnad DR. Haemodynamic patterns in patients with scorpion envenomation. Heart 1998;79(5):485-9. 18. Rai M, Shukla RC, Varma DN, Bajpai HS, Gupta SK. Intracerebral hemorrhage following scorpion bite. Neurology 1990;40(11):1801. 19. Bahloul M, Chabchoub I, Chaari A, et. al. Scorpion envenomation among children: clinical manifestations and outcome (analysis of 685 cases). Am J Trop Med Hyg 2010;83(5):1084-92. 20. Dube S, Sharma VK, Dubey TN, Gouda NB, Shrivastava V. Fatal intracerebral haemorrhage following scorpion sting. J Indian Med Assoc 2011;109(3):194-5. 21. Porcello Marrone LC, Marrone BF, Neto FK, et. al. Posterior reversible encephalopathy syndrome following a scorpion sting. J Neuroimaging 2013;23(4):535-6. 22. Garcia ML, Gao Y, McManus OB, Kaczorowski GJ. Potassium channels: from scorpion venoms to high-resolution structure. Toxicon 2001;39(6):739-48. 23. Rogers JC, Qu Y, Tanada TN, Scheuer T, Catterall WA. Molecular determinants of high affinity binding of alpha-scorpion toxin and sea anemone toxin in the S3-S4 extracellular loop in domain IV of the Na+channel alpha subunit. J Biol Chem 1996;271(27):15950-62. 24. Romero NO, Hernández TJ. Cerebral edema associated to scorpion sting: a two-case sting report. J Venom Anim Toxins Incl Trop Dis 2005;11(4):594-600. 25. Gadwalkar SR, Bushan S, Pramod K, Gouda C, Kumar PM. Bilateral cerebellar infarction: a rare complication of scorpion sting. J Assoc Physicians India 2006;54:581-3. 26. McKinney AM, Short J, Truwit CL, et. al. 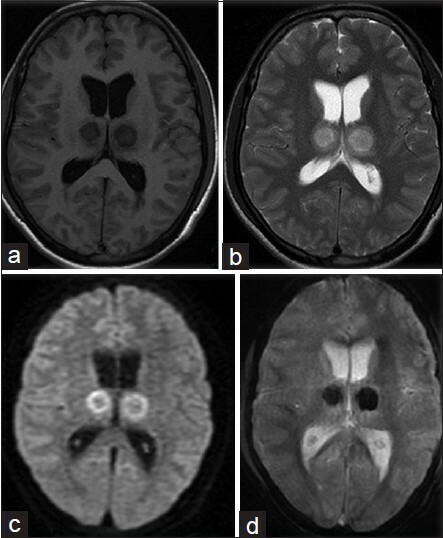 Posterior reversible encephalopathy syndrome: incidence of atypical regions of involvement and imaging findings. AJR Am J Roentgenol 2007;189(4):904-12.